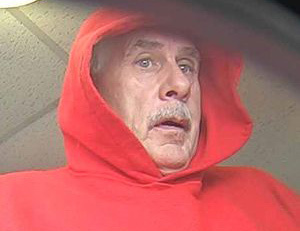 The FBI's Bank Robbery Task Force reports this guy is wanted for holding up the Century Bank branch at 275 Hanover St. in the North End, around 3:35 p.m. on Feb. 6. If he looks familiar, contact the task force at 857-386-2422. From this photo, it's hard to make out exactly how many hairs the perp has in his left eyebrow. It's about time the quality of these videos begin approaching that of a cheap cell phone. I dunno, when I look at the photo from a distance, I see Marilyn Monroe. That's obviously Alex Karras AKA George Papadapolis from Webster. Where do I pick up my reward?